LONDON — President Xi Jinping of China flew home from Manchester on Friday, capping a four-day state visit of pomp and little public criticism of China’s domestic policies. But as he concluded a successful visit, with Prime Minister David Cameron of Britain praising the opening of what he called a golden era of business and diplomatic relations, Chinese dissidents accused the British police of unnecessary force as officers arrested three prominent demonstrators in London on Wednesday. One of those arrested, Shao Jiang, 47, an academic and blogger for Amnesty International, is a survivor of the 1989 crackdown on pro-democracy demonstrators in Tiananmen Square. 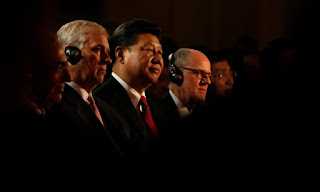 He was arrested on Wednesday for stepping in front of Mr. Xi’s motorcade near a lavish London reception for the Chinese leader. Two Tibetan women, Sonam Choden, 30, and Jamphel Lhamo, 33, were also arrested at the same protest as they tried to unfurl Tibetan flags as the motorcade passed. The London police said that they had detained a man and two women to prevent a breach of the peace and then arrested them on suspicion of “conspiracy to commit threatening behavior.” The three were released on bail.